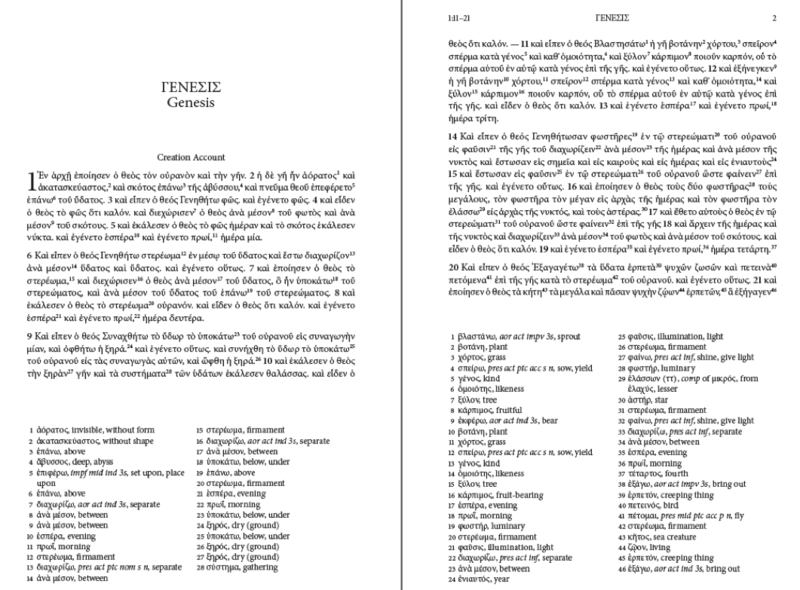 Septuaginta: A Reader’s Edition presents the complete text of the Greek Old Testament (including the apocryphal/deuterocanonical books), accompanied by bottom-of-the-page glosses for infrequent words and (where applicable) parsings as well as an appendix providing a glossary of common words. It is currently available on Amazon and ChristianBook. This project was initiated in 2014 by Greg Lanier and Will Ross, who—after seeing the positive reception of the HB and GNT “Reader’s Editions,” which provide the full original text with vocabulary helps and other aids—saw the need for such an edition for the Septuagint. The goal of this project is to provide students of Koine Greek, especially those with an interest in the OT and NT, with the full text of the Greek OT (including double-texts and apocrypha) in such a form that they can read longer portions of text without constantly consulting a lexicon or parsing guide. After years of work and a fantastic partnership with the editorial staff at Hendrickson Publishers, we are proud to be releasing (est. November 2018) this two-volume work, which includes 1,175 chapters of Greek text across over 3,300 pages, English headings to assist the reader, and over 125,000 vocabulary glosses in the running apparatus. You can stay tuned in by clicking the “Follow” button at the bottom of the page. An image of the inside of the volume is included below. For more details on various aspects of the book (apparatus, glossary, layout), see the various entries in our blog.